Skillfully crafted to match a wearer’s unique style and personality, Michael M men’s wedding bands are sure to satisfy. Discover for yourself impressive Michael M collection of men’s wedding bands featuring channel, milgrain, and uniquely burnished pieces. 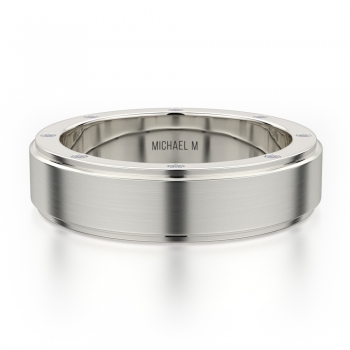 Handsome and endearing, the selection of Michael M men's wedding bands exhibit the fine quality craftsmanship that is recognizable only in Michael M designs. 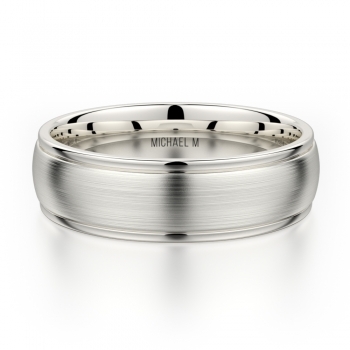 Men's wedding bands from Michael M come in various styles including captivating polished, matte, and textured finishes. 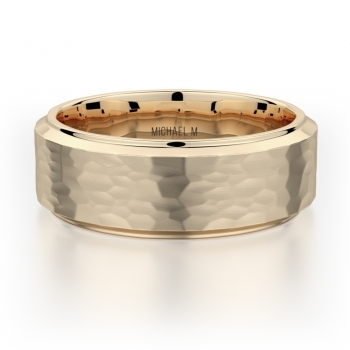 In addition, the rings are available in the highest quality precious metals including platinum, 14-karat and 18-karat white gold, yellow gold, and a bold rose gold. 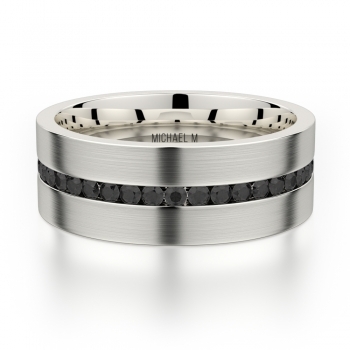 Continuing their pursuit of innovative design, some Michael M wedding bands also come adorned with luxurious white diamond and black diamond pave settings for the fashionable male, along with a plethora of other fabulous and masculine styles. To commemorate your eternal love, consider the captivating look of a Michael M men's wedding band. 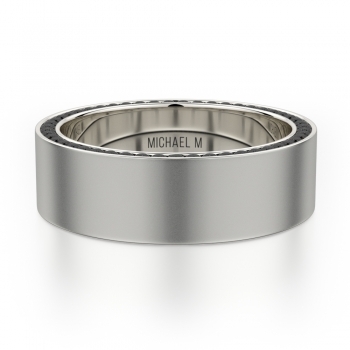 Available only at authorized retailers nationwide, Michael M wedding bands are sure to please men with both contemporary and traditional sensibilities. Popular models of the designer name include the daring Michael M wedding band MB-108, whose endearing, sleek rose gold metal suits the modern man and the unique Michael M wedding band MB-116, whose diamond pave adorns the underside of the band. For those interested in visible, black diamonds, the MB 109 offers an ultra-chic look of a black micro-pave of diamonds wrapped around the band. Founded in 2008 by Michael Meksian, Michael M jewelry seeks to enchant all women with their finely crafted collections of engagement rings, wedding bands, and fine jewelry items including necklaces, earrings, bracelets, and fashion rings. Devoted to exceptional craftsmanship, Michael M designs and handcrafts all of their creations in their Los Angeles based studio, ensuring that all their pieces meet the premium quality standards of Michael M.
To continually display innovation, the craftsman at Michael M understand that "some traditions are meant to be broken." As such, the designers at Michael M utilize both traditional techniques in design and forward thinking technological advances in order to create the mesmerizing pieces from the collections at Michael M. Handcrafted in their Los Angeles studio, only expert-level craftsman work towards creating the unique designs from Michael M.